Well when we set up the first veg bed back in January last year, I was very eager to get planting. So eager that I looked at what seeds I had that could be planted that early and went mad on them. As such we ended up with a lot of white onions (not too bad apart from the fact we pretty much only eat red onion) and a ton of leeks. Now I love a good chicken, bacon and leek pie and was interested in finding other ways I might like it. I didn’t realise until after I planted them that Sam isn’t keen on them at all. Of course, once the excitement of my first planting waned, my attention got caught on other things. We ended up with 3 rows of leeks that hadn’t been thinned, sown so tightly that if you tried to pull one you got about 5! Once Nov rolled round I needed to find a way to cook and eat all these leeks despite me being the only one who likes them. I’m firmly of the ‘if we grow it we eat it’ mentality, trying to waste as little as possible. I may just have to have a bit of a longer think before I plant things next year. My first experiment was to chuck some leeks in the roasting pan. When I do tatties I add in red onion and garlic half way through anyway, and leek is related so that’ll work right? Well it did, and Sam even liked it to boot! Roast tatties with garlic, red onion and leek are now a staple with our roasts. It also works well in my modified bubble and squeak. I’m not entirely sure Chi is liking them but she is going through a phase of rejecting certain textures, she had been a big fan of cooked onion but has gone right off it. She is however fully embracing the food preparation. I’d been giving her pieces of garlic to peel when I’m doing meal prep, she just needs you to loosen the skin and she does the rest. 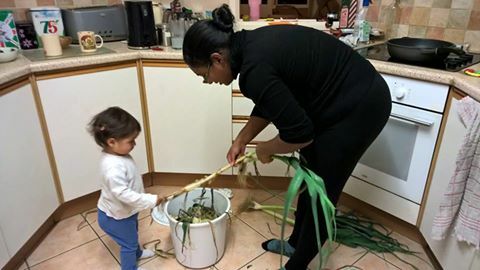 I gave her a leek the other day and she loved peeling it, even though it was taller than her! 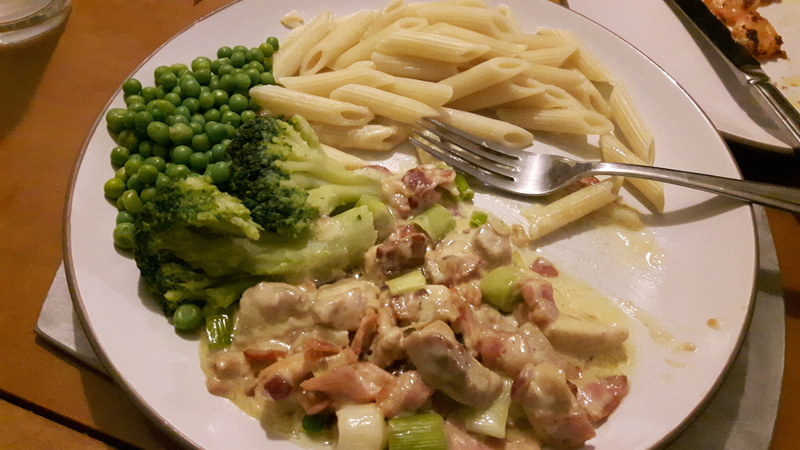 With Sam on board for roast leek I decided to brave a chicken, bacon and leek in a creamy sauce with pasta. It is horribly unhealthy for the amount of dairy in the sauce but it’s had a big thumbs up from most people (a friend who doesn’t like leek at all wasn’t very keen) and is now Sam’s request for me to cook when we have people over, with my apple and pear crumble for dessert. I’ll pop the recipe at the end of this post. I’m starting to see a seasonal flow to my cooking. Before the smallholding we would eat pretty much the same meals all year round. In spring we had a lot of goose egg omelettes. Then in early summer egg and chips from our chicken or goose eggs and our tatties was a staple. As the polytunnel really started producing I ventured into ratatouille. Sam has labelled my chicken, bacon and leek my autumn meal. It’s not quite as home grown as the others but I’m starting to really look at what we are growing and cook that with bought foods that compliment it. I used to buy peppers and mushrooms year round, but even once the polytunnel has stopped producing them I’m still not buying them, I’m switching our meals to more seasonal. It’s exactly what I wanted to happen and it feels so wonderful. The pinnacle for me, food wise, of this year has to be our Samhain dinner. For those who don’t know Samhain is a pagan festival that falls on Halloween. 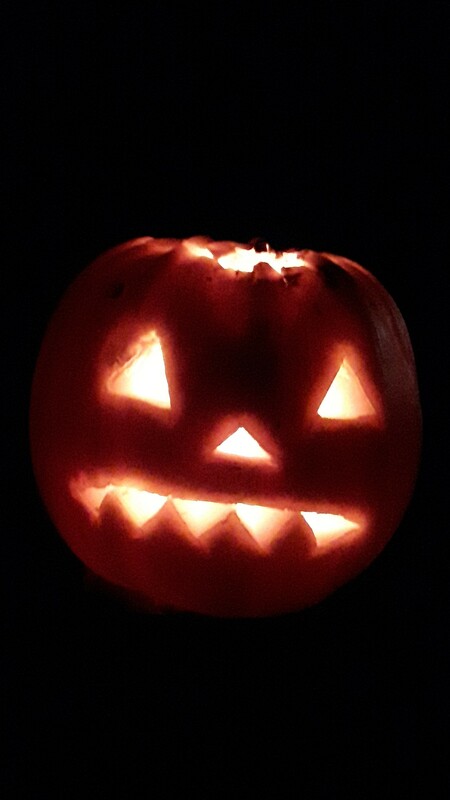 My general celebration is to do a pumpkin (or failing that a tea light in a lantern) to guide any spirits home, then cook a nice meal and eat it with some wine and a spare place set at the table for any spirits who wish to join. After the meal I libate (leave as an offering outside) some food and wine for the spirits. I spend much of the day thinking of those who have gone before (ancestors and friends) and those who are yet to come. I also view it as my new year. Every Samhain I try and cook something really homely, if I can with as much of our home grown food as possible. Sam came home this year to a carved pumpkin and a roast dinner being laid on the table. He knew the pumpkin was ours, and the chicken as we had killed two of Aino’s cockerel chicks the day before. As he tucked in he asked about the origin of various foods and in the end I said it’s all ours, right down to the wine we were drinking. That really was a satisfying meal, roast chicken, roast tatties, roast onion, roast garlic, roast leeks, roast pumpkin, roast carrots and fried chard washed down with plum wine and followed by an apple and pear crumble for dessert. Plus we had passed what I thought would be our hardest challenge. Could we see something born, care for it, kill it and then eat it? If we can’t the whole lifestyle falls apart and I would have had to seriously think about eating meat, but we passed and knowing the animals had had a good life made it all the more satisfying. There’s still somethings I’d like to change (a better broody coop and a much bigger teenage run area) but I am happy with the lives our animals are living. Right I promised you a recipe for the chicken, bacon and leek. The creamy sauce is adapted from this recipe. Pop your butter in a small pan and melt on a low heat. Put a splash of vegetable oil into a saute pan and cook the garlic until you can slightly smell it/it starts to brown. Add the chicken to the saute pan and cook. Pop the bacon in a frying pan and cook, trying to break the cubes up as much as possible. Your butter should have melted now, pour in your cream and raise the temperature to bring it to a simmer. Then let simmer for 5 mins. Try not to let it boil. The chicken should be pretty done and the bacon done by the time the cream is simmering. Add the cooked bacon, the onion and leek to the saute pan . Once the sauce is simmering add in the cheese and garlic and stir quickly to ensure it all melts. 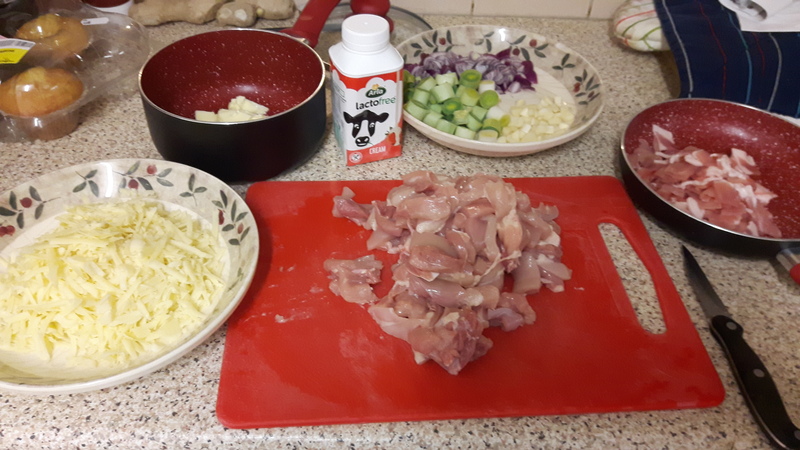 If things have gone smoothly your sauce will be ready before the leek and onion are soft so you can just pop it to the side. Once the leek and onion are soft in the saute pan pour your sauce over and stir everything together. Serve with rice or pasta and some veg. We did home grown corn on the cob the other day which was tasty. I’m also tempted to do some mashed potatoes and make it into a pie but I haven’t braved that yet – pies are scary. Enjoy and don’t think of the calories! PS if you like reading these posts, and you haven’t done so already, follow us. You’ll get an email notification each time we update. The link should now be on the left if you’re on a computer or below if you’re on your mobile.